We made a simple card in the last Christmas Card Class using the Night in Bethlehem stamp set. I made my card in Black and white, but it could easily be mixed up with various colors and styles. How’s that for a simple Christmas card? Embossing folders and DSP sure make it easy to make beautiful cards, don’t they. What did we do before we had embossing folders? Thank you for taking the time to stop by today. I hope it’s a great day for you! 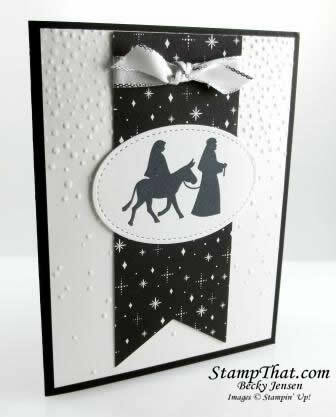 The “Night in Bethlehem Simple Card ” is so beautiful in black and white. How did you make the bumps on the white card stock? Were the stars already on the paper or did you have to put them on? Your stitching on the center piece is so perfect. Super job Becky and thank you for sharing.